The ST2011-2 Storage Server has Dual E5-2600 v4 Series processors (up to 44 cores and 88 threads) and supports up to 512GB of DDR4 RAM. This 2U Rack Server has 8 hot swap hard drive bays and redundant power supplies for mission-critical reliability. 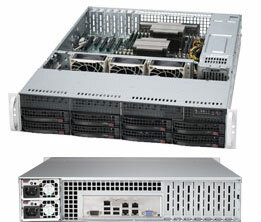 The ST2011-2 Server is designed for dense computational and storage requirements and is perfect for file storage, web hosting, and other high-data usage applications.